That’s just what I mean, about stories getting started. The truth, as it tends to be laid out on the page, Marías finds either unrefined, or without saying exactly so, edited badly: truth, it seems, is so complex, that regardless of being set out ‘as it happened’ or folded into a fiction, the point of it in writing has been overlooked; that is, the skill—a veritable magician’s act—required to present a tale both true and false, not in obvious black and white or primary colours, but blended, shaded, finessed. And the process of this does not simply happen on the paper, but in the imagination—the memory—over time, facts taken in or told to us allowed to develop the patina of time, and more than that, the residue of other perspectives of those truths. Like a chameleon, truth is adaptable. The successful use of it in a story, is how well it adapts to its surroundings, the writer’s innate ability to understand how it fits into the overall context, regardless of the context itself changing. Marías’ family are the seeds in the rich ground that he will later reap the harvest of: his great-grandfather Enrique Manera y Cao, ‘landowner and soldier’, had also been a novelist. He comes across one of his books in an old bookshop—to find one’s flesh and blood history in that way already part of the natural process of truth into fiction. An anecdote about Cao, a beggar, and a curse is told to Marías, which is taken in more in the form of a story; perhaps because of that, it takes hold and is later used in several guises: a story, an article, and then again in Dark Back of Time. This re-use and re-invention of reality is akin to some of the ‘mask’ paintings of James Ensor: what in reality must have simply been a pile of artist’s masks as models turn up over and over as different characters; familiar but changed. We are never quite sure that they are meant to be the same from one to the next, or even from the beginning. But in those masks is the beginning, and the subsequent creations are their own characters, specifically within the context of each separate painting, and yet the viewer knows there is an origin image somewhere in the mind of Ensor. In Never any End to Paris, Enrique Vila-Matas recalls a period of his youth in that city, during his beginnings of becoming a writer. He remarks on Borges rewriting the old, and from there draws parallels to Orson Welles’ F for Fake, the idea of ‘the slippery border between reality and fiction’. It feels like something of a lightbulb moment, for he goes on to say ‘I’d have to welcome the invention of the real, in the same way I’d have to invent myself if I really wanted to be a writer.’ And in a perfectly serendipitous way, Marías refers to Isak Dinesen (Karen Blixen), who captured Welles’ imagination (so much that the famously talkative legend was too overwhelmed to meet her in person) with her stories: he quotes her ‘precept’: ‘Only if you can imagine what has happened and repeat it in imagination will you see the stories, and if you have the patience to carry them inside you for a long time and to tell and retell them, will you be able to tell them well.’ The world seems secretly connected and to make an almost mystic sense when such thoughts appear and re-appear. On reading this cahiers, before I’d even come to this reference, I’d been thinking of Welles, Dinesen, and ____, who is writing of those very people and the magical ‘invention of the real’—not magical realism, but the storage and alteration of memory, the spinning of it into Marías’ cloth of invention that drapes our histories so richly. There is also a seamless relevance in the postface by translator Margaret Jull Costa when discussing translating the works of Marías. She notes that she first translates the words exactly ‘as it stands’ and then goes ‘over it again and again until every part is connecting as it should connect and the flow of thought and language is retained.’ She too, then, starts with a truth, and considers it in the context of the story. What she and other translators do is parallel to the idea of rewriting and retelling, for each translation will be different to the next, while retaining the essence; language as Ensor’s masks, as Blixen’s stories emerging from repetition. To begin at the beginning, yes, but it is how and where we allow a truth to develop and connect—that vast, almost seemingly infinite midsection of time and memory until the finish—writing as synaptic impulses that draw upon our history and knowledge to create not just a story, but ourselves. Javier Marías, born in Madrid in 1951, has published fourteen novels, two collections of stories, and several volumes of essays. His work has been translated into forty-three languages, and he himself is a translator into Spanish of several English-language authors, including Joseph Conrad and Laurence Sterne. He has won many international literary prizes, including the Dublin I M P A C award for A Heart so White. Margaret Jull Costa OBE (born 2 May 1949) is a British translator of Portuguese- and Spanish-language fiction and poetry, including the works of Eça de Queiroz, Fernando Pessoa, Javier Marías, Bernardo Atxaga, José Régio and Nobel Prize winner José Saramago. Images courtesy of Tomoé Hill and Sylph Editions (artwork by Wilfredo Lam). To Begin at the Beginning is part of The Cahiers Series. They are published by Sylph Editions in collaboration with The American University of Paris. The goal of this series is to make available new explorations in writing, in translating, and in the areas linking these two activities. Author and publishing information courtesy of Sylph Editions. Translator bio courtesy of Wikipedia. 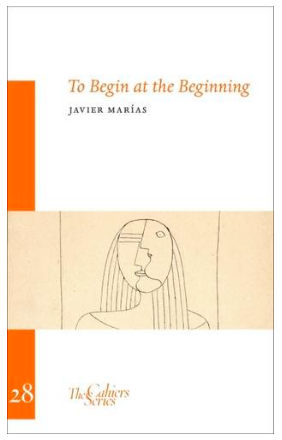 Posted in Book reviews and tagged Javier Marías, The Cahiers Series, To Begin at the Beginning. Bookmark the permalink.